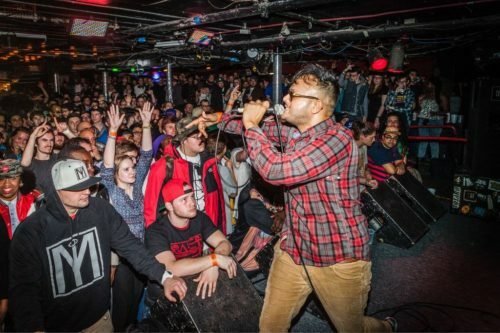 Raj Haldar is a rapper from Philadelphia who works under the name Lushlife. He also creates short rap videos about science for the TV channel Nick Jr.
Quinoa seemed like such a funny and unusual word. It got Mr. Haldar and Mr. Carpenter thinking about other strange words and different ways to spell things. 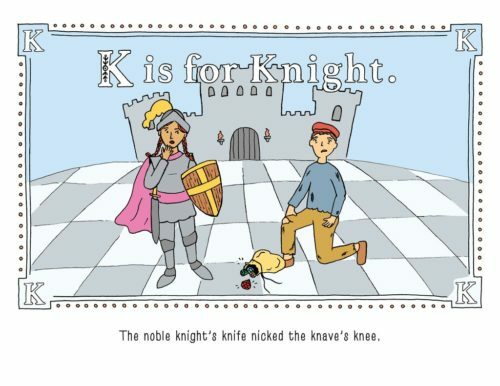 They thought it would be funny if a whole alphabet book was based on words with silent letters and unusual spellings. Mr. Carpenter, who programs computers, has a three-year-old daughter. Mr. Haldar doesn’t have children, but he is used to creating things for kids. Besides rapping, he also creates short rap videos about science for the TV channel Nick Jr.
Mr. Haldar (right) is a rapper and Mr. Carpenter (left) is a computer programmer. They wrote the book together. Maria Tina Beddia (center) drew the pictures. The two began to keep a list of funny words they could use in their book. They focused on words where the first letter was silent. Sometimes this was easy, but for some letters it was difficult. 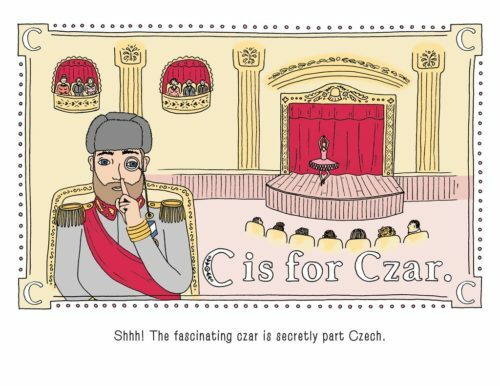 The hardest letter for them turned out to be the letter D. They had to use the name of a place in Africa since there was no ordinary word that starts with a silent D.
Mr. Haldar and Mr. Carpenter began to keep a list of funny words they could use in their book. They focused on words where the first letter was silent. 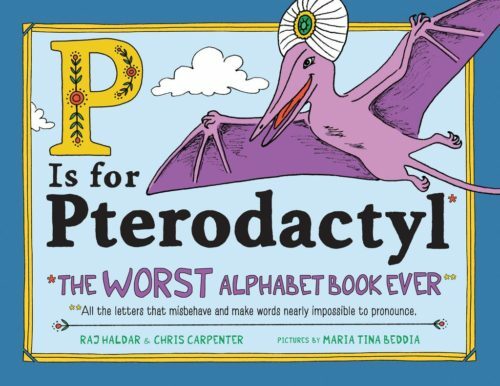 The book is called “P is for Pterodactyl: The Worst Alphabet Book Ever”. Mr. Haldar and Mr. Carpenter got Maria Tina Beddia to draw the pictures for the book. Finally, they took it to Sourcebooks, a company that publishes books. The company was excited about the book. 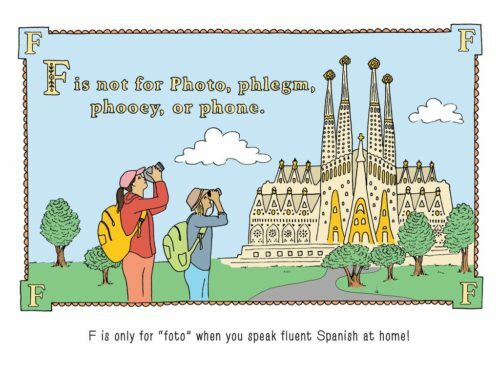 When P is for Pterodactyl came out, it was a success right away. All 10,000 copies of the book were sold the very first day. When P is for Pterodactyl came out, it was a success right away. Only 10,000 copies of the book were printed at first, and every copy was sold the very first day. Once people started to talk about the book on the Internet, even more people ordered the book, even though they knew they would have to wait. 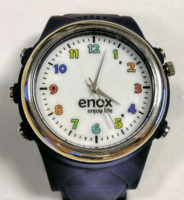 Now the company is printing over 200,000 more. At least 100,000 of those have already been sold. 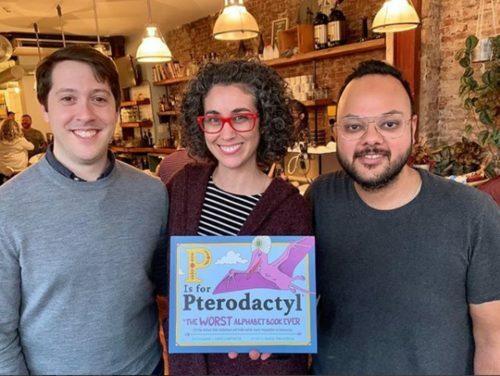 At one point, P is for Pterodactyl was the number 3 book on Amazon, the biggest bookseller on the Internet. Mr. Haldar believes that kids really like the difficult words. He says the book “brings out the word nerd in everybody”. Mr. Haldar was surprised by how popular the book has become, but he thinks he understands why. He believes that kids really like the difficult words. He says the book “brings out the word nerd in everybody”.